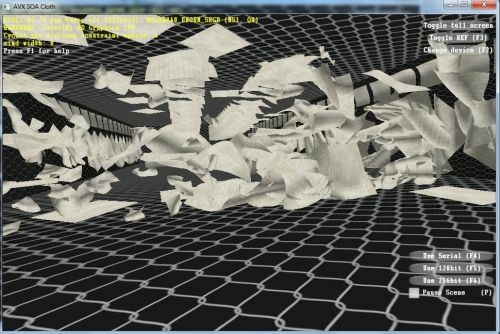 If you don’t have a AVX-capable CPU but want to see Intel’s AVX cloth demo, here is a recompilation (done by Erwin Coumans, Bullet Physics main author) using AVX emulation with SSE instructions: Intel Cloth demo SSE version. No source code available, only the binary. I wonder if NVIDIA will make a PhysX AVX version. What will be the implications of that port? Source code added, it is simply using a modified version of Intel’s original AVX emulation header file. The avx emulation is likely slow, because of the brute force __emu_mm256_unpackhi_ps. My goal was not to have a fast AVX emulation, but just a version of the demo that runs the SSE version on non-AVX CPUs. Note that the differences in performance of the serial/sse version are mainly because I recompiled the demo using Visual Studio 2010 C++ compiler and not the Intel C++ compiler. Why do we need 265 AVX? Does the average user have anything to gain in his everyday applications (gaming included)? Oh Erwin’s link works! Thanks! Install Microsoft Visual C++ 2010 Redistributable Package (x86) (4.8mb).